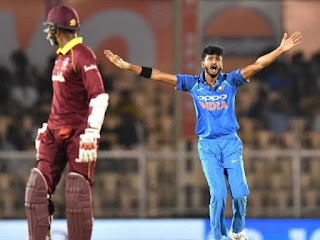 Khaleel Ahmed has been given an official warning as well as a demerit point after being found guilty of Level 1 breach of the ICC Code of Conduct for Players and Player Support Personnel. During the fourth ODI between India and W I in Mumbai, the Indian fast bowler was involved in violation of Article 2.5 of the Code which is ‘using language, actions or gestures which disparage or which could provoke an aggressive reaction from a batter upon his/her dismissal during an international match”. Ahmed, who returned figures of 3/13, advanced aggressively towards Marlon Samuels after claiming his wicket in the 14th over. The on field umpires were of the view that Khaleel’s action could have provoked a counter-reaction from the Windies player. On-field umpires Ian Gould and Anil Chaudhary, third umpire Paul Wilson, as well as fourth umpire Chettithody Shamshuddin pressed the charges against Ahmed. Ahmed accepted his mitstake post the match and agreed the sanction proposed by Chris Broad of the Emirates ICC Elite Panel of Match Referees. Breaking of Level 1 code carry punishments like official reprimand, 50% of a player’s match fee, and one or 2 demerit points.